For other uses, see Miami Marlins (disambiguation). 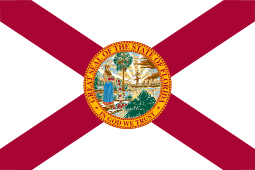 The team began play in the 1993 season as the Florida Marlins. They played home games from their inaugural season to the 2011 season at Hard Rock Stadium, which they shared with the Miami Dolphins of the National Football League (NFL). Hard Rock Stadium was also called Joe Robbie Stadium, Pro Player Park, Pro Player Stadium, Dolphin Stadium, Dolphins Stadium, Land Shark Stadium, and Sun Life Stadium during their tenancy. Since the 2012 season, they have played at Marlins Park in downtown Miami, on the site of the former Orange Bowl in Little Havana, Florida. The new park, unlike Sun Life Stadium (which was criticized in its baseball configuration for poor sight lines in some locations), was designed foremost as a baseball park. The new park's name is a temporary one until naming rights are purchased. Per agreement with the city and Miami-Dade County (which owns the park), the Marlins officially changed their name to the "Miami Marlins" on November 11, 2011. They also adopted a new logo, color scheme, and uniforms. The Marlins have the distinction of winning a World Series championship in both seasons they qualified for the postseason, doing so in 1997 and 2003 — both times as the National League wild card team. They defeated the American League (AL) champion Cleveland Indians in the 1997 World Series, which was notable for shortstop Édgar Rentería driving in second baseman Craig Counsell for the series-clinching run in the 11th inning of the seventh and deciding game. The 2003 season was notable for the firing of manager Jeff Torborg after 38 games. The Marlins were in last place in the NL East with a 16–22 record at the time. Torborg's successor, 72-year-old Jack McKeon, led them to the NL wild card berth in the postseason; they defeated the New York Yankees four games to two in the 2003 World Series. The Marlins would qualify for the postseason and win the World Series in both 1997 and 2003, though both titles were followed by controversial periods where the team sold off all the high priced players and rebuilt. No-Hitters: Marlins pitchers have pitched five no-hitters in team regular-season history, four coming against teams in the NL West and one against a team from the American League (AL). From 1993 until 2011, the Marlins had retired the number 5 in honor of Carl Barger, the first president of the Florida Marlins who died prior to the team's inaugural season. Barger's favorite player was Joe DiMaggio, thus the selection of number 5. With the move to the new ballpark, the team opted to honor Barger with a plaque.Logan Morrison, a Kansas City native and fan of Royals Hall-of-Famer George Brett (who wore that number with the Royals), became the first Marlin to wear the number. After José Fernández' death as a result of a boating accident on September 25, 2016, the Miami Marlins announced plans to build a memorial at Marlins Park in his honor. However, Fernández' number 16 has yet to be officially retired. 2 – played two seasons with the Marlins. Now special assistant to the club. The seating capacity for Marlins Park is 36,742, making it the third smallest stadium (in capacity) in the MLB. Its first regular season game was April 4, 2012, against the St. Louis Cardinals, the ballpark became only the sixth MLB stadium to have a retractable roof, joining Rogers Centre in Toronto (1989), Chase Field in Phoenix (1998), Safeco Field in Seattle (1999), Minute Maid Park in Houston (2000), and Miller Park in Milwaukee (2001). Marlins games are televised by Fox Sports Florida. FS Florida's slogan in 2008 was "You Gotta Be Here." For the 2009 season the new slogan is "It's where you wanna be." There are no games available over-the-air, with the exception of games broadcast on Fox Saturday Baseball; the last "free TV" broadcast of a game was on WPXM-TV in 2005. Rich Waltz is the play-by-play announcer. In 1989, the release of popular movie Back to the Future Part II, had a reference to the Chicago Cubs defeating a baseball team from Miami in the 2015 World Series, ending the longest championship drought in all four of the major North American professional sports leagues. The Marlins are the first team in Major League Baseball to have a dance/cheer team: "The Marlins Mermaids." Debuting in 2003, the "Marlins Mermaids" quickly gained national exposure, and have influenced other MLB teams to develop their own cheer/dance squads; this is inspired in part by similar squads from the NFL and NBA. In 2008, the Florida Marlins debuted "The Marlins Manatees", Major League Baseball's first ever all-male dance/energy squad to star alongside the Mermaids. As of 2012, the Marlins have abandoned the "Mermaids" and "Manatees" for in-game entertainment instead using an "energy squad", a co-ed group of dancers. In June 2013, the book, "The Forgotten Marlins" A Tribute to the 1956–1960 Original Miami Marlins" was published. Its author is Sam Zygner (published by Scarecrow Press). ↑ Frisaro, Joe (November 11, 2011). "New-look Miami Marlins make colorful splash". MLB.com. Major League Baseball Advanced Media. Retrieved November 11, 2011. ↑ Frisaro, Joe (November 11, 2011). "Marlins break out new logo, uniforms". MLB.com. Major League Baseball Advanced Media. Retrieved August 12, 2015. ↑ Frisaro, Joe (September 27, 2011). "Sun to set on Sun Life Stadium". Major League Baseball Advanced Media LP. Retrieved August 13, 2015. ↑ Frisaro, Joe (November 10, 2011). "New name, but deep-rooted tradition in Miami". MLB.com. Retrieved November 10, 2011. ↑ Frisaro, Joe. 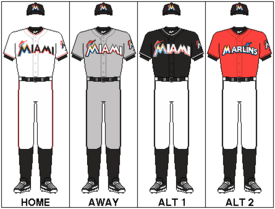 "Miami Marlins unretire uniform No. 5 for Morrison". Retrieved February 24, 2012. ↑ Frisaro, Joe (November 11, 2016). "Report: Marlins to build Fernandez memorial". Major League Baseball Advanced Media. Retrieved November 27, 2016. ↑ "Van Horne wins baseball Hall of Fame's Frick Award". FoxNews. December 8, 2010. ↑ Oz, Mike (10 December 2014). "Reminder: The Cubs won the 2015 World Series in 'Back to the Future 2'". Yahoo! Sports. Retrieved 5 August 2015. ↑ McCorquodale, Amanda (January 13, 2012). "Marlins Mermaids Replaced By 'Energy Team'?". Huffington Post. ↑ Elfrink, Tim (2016-05-24). "Marlins Sue Season Ticketholders, Vendors Bankrupted by Small Crowds". Miami New Times. Retrieved 2016-05-24. ↑ "In Depth: Baseball's Most Intense Rivalries".